On February 1st, 2018, rapper Travis Scott, real name Jacques Webster, became a father when his girlfriend, Kylie Jenner, gave birth to a baby girl. On Sunday, at 4.01pm EST, he tweeted about his “new rager.” But for those unfamiliar with the guy—who the heck is Travis Scott? Let’s break it down. Travis Scott, born and raised in Houston, TX, is one of the most popular rappers of the moment, thanks to his 2015 hit “Antidote,” and a slew of singles that have followed—“Pick Up The Phone,” “Goosebumps,” featuring Kendrick Lamar, and “Butterfly Effect”—all of which landed on the Billboard Hot 100 chart. His last solo album, Birds in the Trap Sing Brian McKnight, went No. 1 in 2016. Last December, he released Huncho Jack, Jack Huncho, a collaborative mixtape with Migos rapper Quavo that hit No. 3. 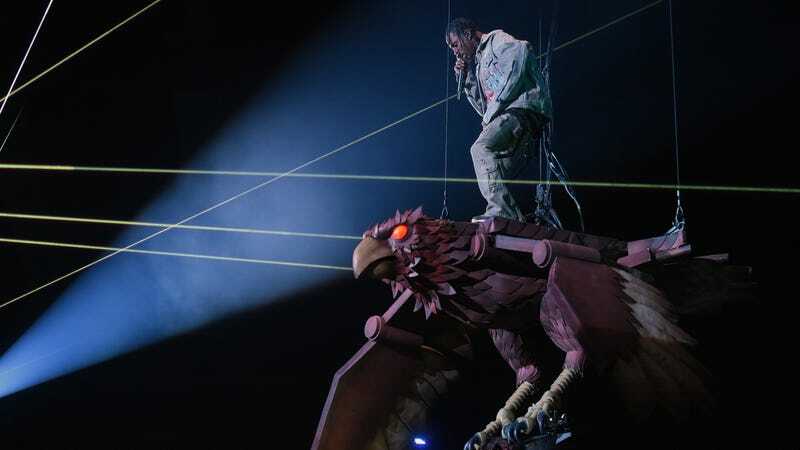 For many rap fans, Travis Scott first arrived on the scene when he signed to veteran Atlanta rapper T.I.’s Grand Hustle record label, and grew into his own artistry after working with Kanye West in 2013. His music is best described as a chaotic fusion of contemporary trap and Kanye’s most baroque moments (he frequently works with West’s go-to producer Mike Dean,) and his own desert punk aesthetic. Scott is also known for rowdy live shows, including last year when a fan jumped off the balcony and broke their legs. Like Jenner, Travis Scott’s career has veered into the world of fashion. The rapper has modeled for Saint Laurent in the past and in 2017, launched a collection with Helmut Lang.